Last edited by RARECJ8; October 7th, 2013 at 01:04 PM. It's funny that Pevone is largely no shooting yet NDOW says deer in the area for hunting. Spanish springs area? Used to go to derby cause I didn't have 4x4. Now I have an F350 so I can get out a bit. Hungry valley? Golden eagle? Any areas still open? Might as well go to the gun range. Shows people use it and its pretty much the only safe place to go. Spanish Springs is going to get shut down because people dump and I see it getting blamed on shooters not on off roaders for once. Either that or Carson range. At least the Washoe range is still open too. I've read that someone wants to sell it. I think ink thee is a road past the range on the right hand side that has some shooting spots that look like a private bay. I've read that someone wants to sell it. I thought what I was reading was fishy. County range privately owned. Either way I support people using the range often. More people involved in using the range means improvements. Nothing changes on its own. People not coming back hasnt worked to improve anything. Same complaints seem to come up often enough that people need to make the PUBLIC range a PUBLIC INTEREST. That being said, Stillwater Firearms will get a lifetime member out of me shortly. Even if I DO know at least two members already. Fallon USPSA at Stillwater Firearms Sunday. Show up between 8:00am and 8:59am and sign up for some fun. I won't make it since I'm buying a house and trying to save as much as I can before going into escrow. I should be back at it in a few months pending living expenses aren't above what I've calculated. Unless I upgrade my reloading bench from a collapsible workbench. HAHAHAHA that's what happens when you post from a mobile device. After a ten-day period elapses, it will take effect, and you will be able to read the full text of the code change. It took me and my wife 15 months of hard work to get this passed, an we are very grateful to Commissioner Bonnie Weber for her support of our initiative. It is a step in the right direction. The Sheriff's Office agreed not to oppose the initiative, because they rarely get calls for "shooting near houses" in Palomino Valley. We also should thank Assistant District Attorney Paul Lipparelli for his work in steering us through the legal landscape, and for crafting the new language. So at what point between digging the ditch you’re told to dig, and being shot into it, are you going to fight back? This is funny just because my parents live out there and I always hear people shooting. Even when I tell them it's technically illegal they never cared. Maybe because shooters are aiming towards the hills, maybe because people just leave you alone. Either way way to put in the foot work and get something like this passed. If only they'd extend that to the homes in South Reno and the shooting area behind the ex-shotgun club. We wanted to remove the modern "Sword of Damocles" hanging over our heads out here. Yes, residents in Pal Val have been shooting on their properties for many years, blissfully ignorant of County Code 50.092. While unlikely that a Sheriff's deputy would charge someone for violation of this little-known code, the possibility exists that a person could be charged with a violation. We wanted to change that. That, and the fact that the distances within the code were not appropriate for very large parcels sizes that are typical of this area. There's more behind it, but that's the essence. Excellent news! Thank you so much for your hard work and dedication! Great work, I'd always rather have the laws match what I already plan to do. Back to testing targets in the back yard. www.moatargets.com High class steel targets at low class prices. Hell yeah!!!! That's awesome, good news that our county is willing to move lines. New shooting restricted ares marked in yellow. Pretending they want to be reasonable, work with shooters and promote safety on Peavine, then you look at the new ordinance boundaries and the very popular and very safe area east of Eagle Canyon Dr before the Indian Colony ends up off limits. This is an area that was designated as shooting, with WC signs reminding shooters to be safe and pack out their trash. No reason for it to be shut down. I can't wait to see the next area these anti-gun assholes decide to start advocating to be taken away with their false and dramatized stories of bullets whizzing past their ears. Last edited by jfrey123; August 9th, 2016 at 11:54 AM. I had mentioned that area in one of my posts BECAUSE it is so popular. I'm not sure why the area was included with the "Peavine" land closure other than it was on the agenda and if they were going to get it closed now was the time. It will still get filled with junk AND bullet casings since people will continue to shoot there even with the signs posted. I never thought it was a problem up there other than the homes way off in the distance who might not like hearing the shooting but I doubted that forever. They also closed off the area in South Reno behind the old Sage Hill area. Doesn't matter since cops never went out there, the gate is FAWKED and no one cares until cops start enforcing it at which point the currently posted congested signs will get shot and MORE people will complain about land being closed. 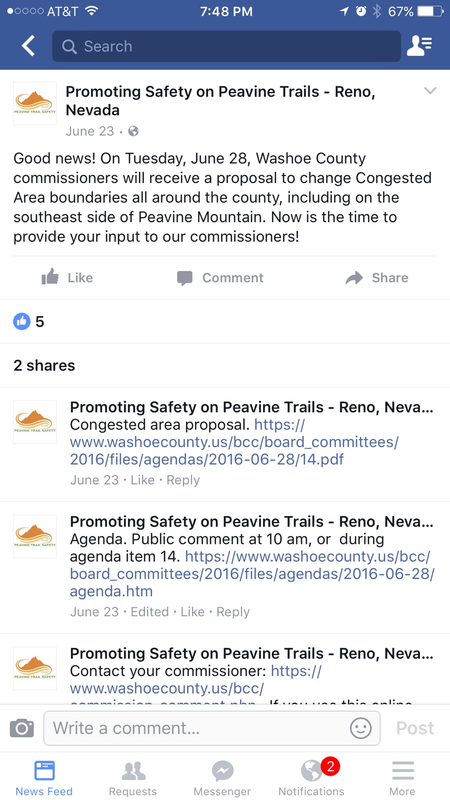 The Peavine Trail Safety group advocated for changes on Peavine Mountain, only. The county commissioners and staff chose to modify other congested area boundaries around the county. We don't know why they selected specific areas, except what the staff ordinance proposal stated: "The proposed County Code amendment will extend the boundary of the Washoe County "congested area" where uncontrolled discharge of firearms is not permitted as it would result in the greatest risk of injury to life and limb. Due to increased construction activity, annexations by the City of Reno, and implementation of planned outdoor recreation trails and roadways, the current congested area boundary has been determined to be inadequate." I can only surmise that commissioners were receiving complaints about other areas from constituents, but it wasn't from or through us at www.Facebook.com/PeavineTrailSafety. As far as Eagle Canyon Drive is concerned, the future development slated for that area will likely make it off-limits in any case. Everyone had equal opportunity to make their views about the new boundaries known in public comment. It is indeed "good news that our county is willing to move lines" in response to community input. Well, your own FB page posts demonstrate your group did, in fact, advocate for closures beyond just Peavine Mountain. Further, the fact you demonstrate knowledge of a future development near the area of my concern demonstrates you aren't just concerning yourself with affairs on Peavine. It is, indeed, good news when the congested area lines can be moved in the name of public safety. But for groups like yours to push for change where no danger exists just demonstrates your intolerance and goal of total recreational shooting ban (something else that's called for by your FB followers frequently enough). I didn't have a problem with you guys when you were talking about just Peavine issues, but now a legitimate safe spot has been closed. If it could've been an issue in the future, it should've been left to a future meeting. I'll be eager to see what problems your group finds to complain about in the future, and I hope more people learn to oppose you. Last edited by jfrey123; August 10th, 2016 at 07:38 PM. More proof is posting articles about the Shooting Range fire in Storey county. It has nothing to do with peavine OR a shooting range yet your own Facebook page talked it up like it was. Unfortunately, this map doesn't include all areas in the county where shooting is shooting is prohibited: Nevada State Parks, Washoe County Parks, tribal land, and near buildings. The old map included the circles (1000ft prohibited, 5000ft restricted) around buildings, which is helpful for the rural developed areas. I have a pdf copy of the old map that I could upload here as an archive here if someone can let me know how to do that.